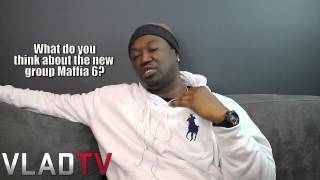 http://www.vladtv.com - Project Pat cleared up a few rumors about Three Six Mafia in this VladTV exclusive. Pat speaks on why Crunchy Black left the group, DJ Paul's Da Mafia 6ix group and what keeps Juicy J hot throughout the years. Pat, one of the co-founders of Three Six Mafia says Crunchy Black decided to leave the group when they won their Oscar in 2006. Pat says Crunchy couldn't handle the pressure that came with the prestigious award. In 2013, Black returned with Lord Infamous, Gangsta Boo, Koopsta Knicca to form the revamped Three Six Mafia now called Da Mafia 6ix with DJ Paul. Pat says he salutes Paul for getting everyone back together, but is sure Juicy J won't be a part of the group. Project Pat Explains Why Juicy J Won't Be in Da Mafia 6ix. Resize; ... Project Pat cleared up a few rumors about Three Six Mafia in this VladTV exclusive. fido Similar Threads: Three 6 Mafia feat. Project Pat - Poppin' My Collar; Juicy J ft. Project Pat - 30 inches; Project Pat - Don't Call Me No Mo (Feat.